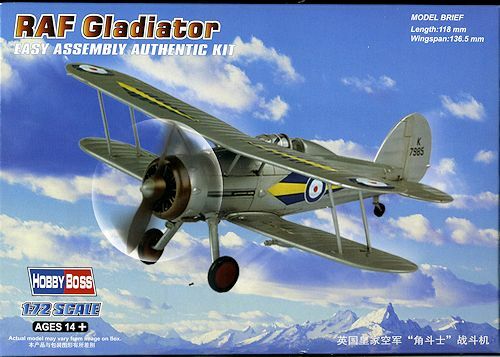 The Gladiator saw action in almost all theatres during the Second World War, with a large number of air forces, some of them on the Axis side. The RAF used it in France, Norway, Greece, the defence of Malta, and the brief Anglo-Iraqi War (in which the Royal Iraqi Air Force was similarly equipped). Other countries deploying the Gladiator included China against Japan, beginning in 1938; Finland (along with Swedish volunteers) against the Soviet Union in the Winter War and the Continuation War; and Norway, Belgium, and Greece resisting Axis invasion of their respective lands. South African Marmaduke "Pat" Pattle was the top Gladiator ace with 15 victories over Italian aircraft. Hobby Boss has had very good sales of its easy build aircraft. They are not complex and quite suitable for the relatively new modeler, or those who just want a fairly quick and relaxing build. This one should be most welcome by modelers. Previously we only had rather old mold kits from Airfix, Heller and I believe Frog to cover the Gladiator in this scale. To keep with the quick build characteristic of this like, the lower fuselage and wing are a single piece as is the upper fuselage and fin. There are large slots in the upper and lower wing to accept the outer struts and the inner struts attach to the upper forward fuselage section, making for very sure alignment. The engine and cowling are a single piece. needing only the carb intake and prop to make it complete. There are large slots for the gear legs and wheels with separate exhaust. Two different wooden two blade props are provided with one being a slimmer blade with no cap. The interior is basically just a seat and stick on a floor that sits atop large receptacles on the lower fuselage. A somewhat thick one-piece canopy sits atop all this. 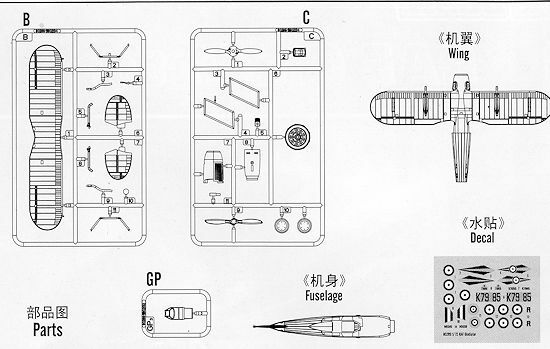 Instructions consist of three construction steps, a parts layout and full color painting and markings guide. N o rigging diagram is provided nor is the box art any help as it shows a photo of the unrigged model. Markings are for two aircraft. One is a pre-war overall silver dope plane from 73 Squadron and the other is one of the Sea Gladiators from the Malta Fighter Flight. Decals are nicely printed, but there are problems. 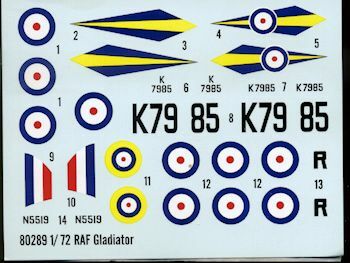 For the 73 Squadron option, the yellow is far too light. Not only that, but the proportions of the colors in the insignia is just wrong with far too much white. Aftermarket insignia will be needed for those who are concerned. Secondly, the Sea Gladiator cannot be built as such without a proper propeller. All Sea Gladiators had a three blade metal prop, and one is not included in the kit. The painting instructions show no real differentiation in the upper surface colors, making look like all one shade, which it was not. So there you have it. This one continues the penchant for Hobby Boss and other Chinese kit makers of having at least one glitch in their kits; in this case decals and the prop issue for the second option. It does not make the kit unbuildable, and I know that many will find enjoyment in building this one. One simply has to realize that to increase the accuracy of the represented model, outside sources will need to be consulted.